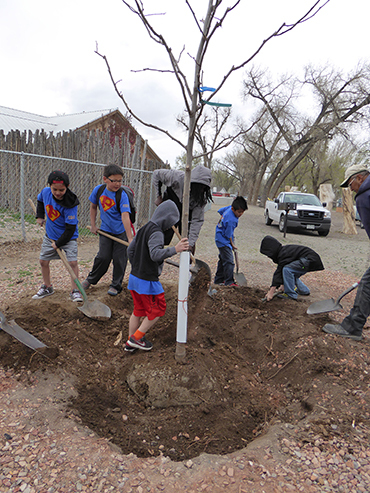 PALS (La Puente Children’s Program) children and supervisors helped beautify Cole Park by planting two trees during Alamosa Arbor Week. More photos of other planting are coming soon! Left: PALS children do a great job of planting a Skyline Honeylocust in the SW area of Cole Park. Above: The wind blew and temperatures dropped, but PALS were all smiles and hard work. They planted a Tatarian Maple inside the path in Cole Park. Below left: PALS gathered around the Tree City USA banner after planting the Honeylocust. 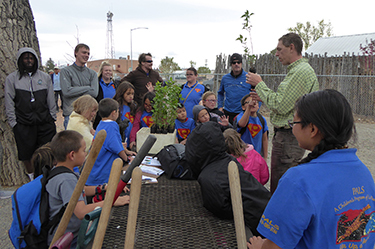 Below: Colorado District Forester Adam Moore explains the planting and care of lilacs. Each child rec'd a lilac to take home and plant. 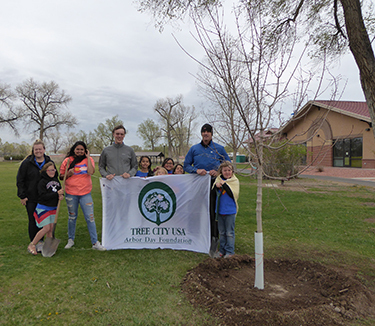 Alamosa's 2017 Arbor Week was sponsored by the Colorado Tree Coalition who provided grant money for maintenance equipment and the production of a Alamosa Tree Brochure. 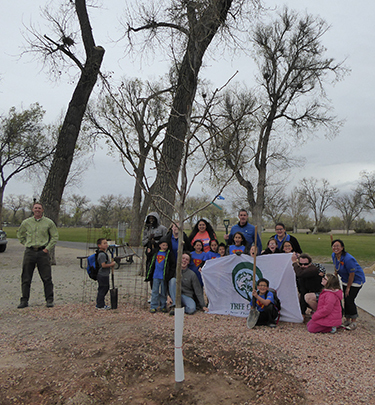 It was also sponsored by the City of Alamosa and the Colorado State Forest.